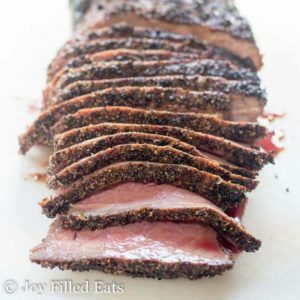 This Java London Broil Recipe is the perfect combination of sweet and spicy. 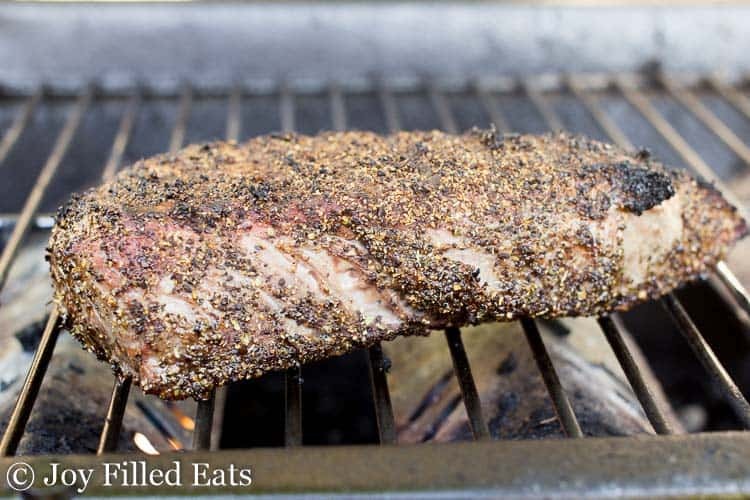 Add a simple, fragrant rub to this inexpensive cut of meat, throw it on the grill, and wow your guests. It is amazing every time. This is not actually my recipe. It is the work of Devin Alexander. And it is delicious. Devin Alexander is a chef who lost 70 pounds almost 20 years ago and has kept it off ever since. Since then she has become a New York Times bestselling author, chef of NBC’s “The Biggest Loser,” restaurateur, and media personality. She is a spokesperson for Truvia which is one of my favorite sweeteners. 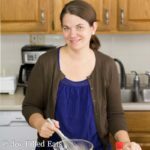 I am fortunate enough to interview her here on Joy Filled Eats. Truvía® Brown Sugar Blend is a blend of brown sugar and stevia. 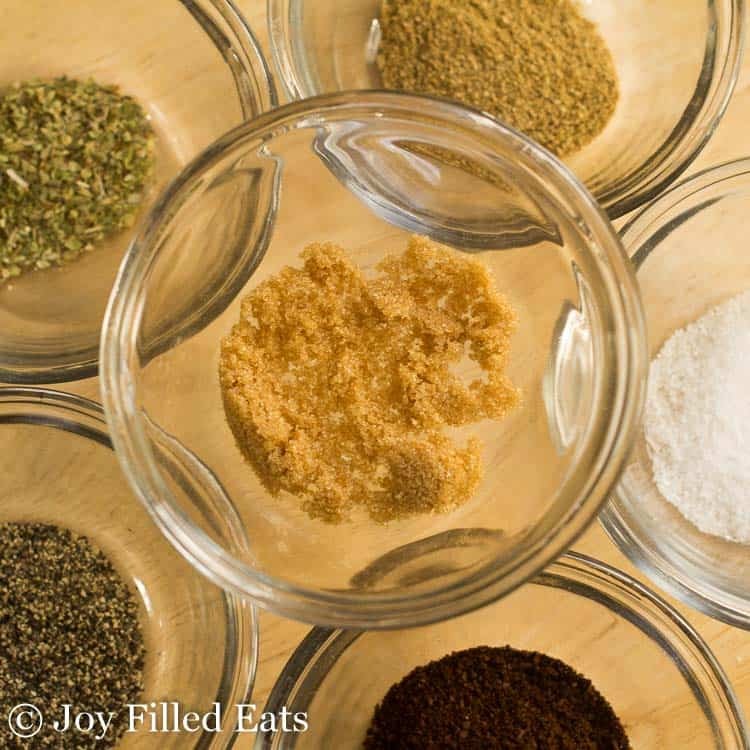 When you are looking for a real brown sugar taste it is a good alternative with 75% fewer calories. A little goes a long way and this London broil only has 1/2 tablespoon for the entire piece of meat. It adds a negligible amount of carbs and a lot of flavor. 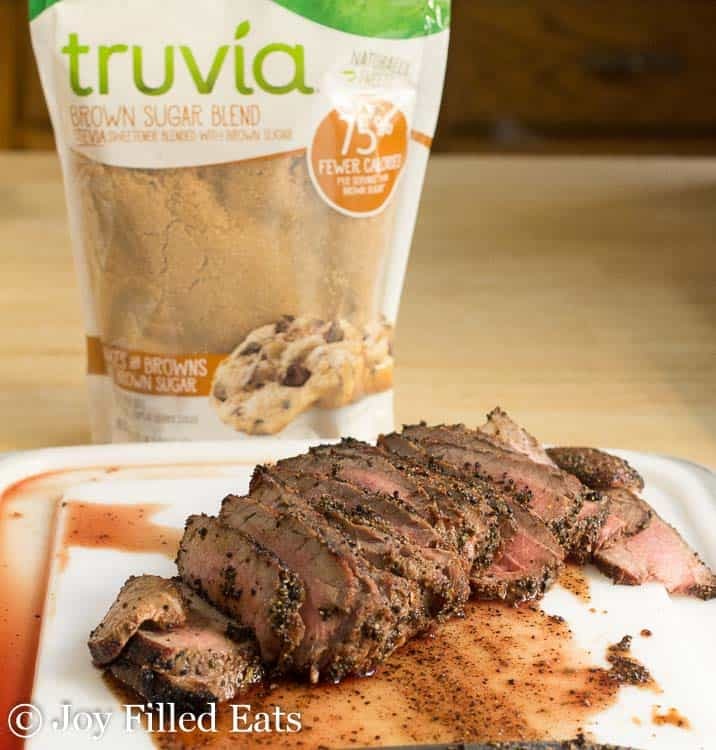 In addition to the Truvía® Brown Sugar Blend, Devin’s sweet and spicy dry rub for this London Broil Recipe features freshly ground coffee, oregano, coriander, salt, and pepper. 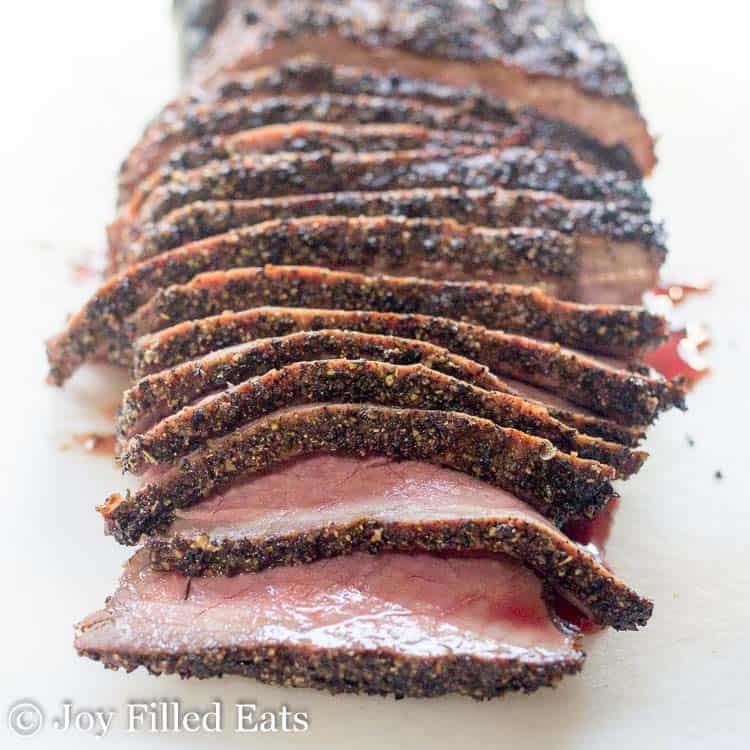 Taryn: What vegetables do you like to toss on the grill with your Java London Broil? Devin: I love grilling red, yellow and orange bell peppers and red onion with just a touch of olive oil, pink sea salt, and pepper. The sweetness of the peppers compliments the steak so well and adds tons of color to the plate! And, of course, we all know that corn on the cob is perfect on the grill for summer months! What are some things that help you keep up with summer entertaining all summer long? You’ll also find a plethora of fruity tea bags in my pantry to make pitchers of delicious iced tea; my two current favorites are passionfruit and hibiscus sangria! Not only do these iced teas taste great without a ton of added sugar, they’re so beautiful and feel indulgent while containing zero calories. I also stay stocked up on all of the Truvia products so that I’m prepared for just about any audience that swings by my house during the summer months or blending up cocktails for my girlfriends, Truvia helps me keep summer sweet (without the calories!). What makes Truvia ® different from other natural sweeteners? Stevia leaf extract is a key ingredient in all Truvia Sweetener Products. The sweet components of the leaf are extracted and purified to create stevia leaf extract. Truvia Sweetener products are a blend of Truvia stevia leaf extract and other natural ingredients to enhance the flavor and provide a crystalline appearance to Truvia. Unlike other natural sweeteners, each delicious taste of Truvia contains extract made from only the best tasting part of the stevia plant. What are your favorite healthy treats for the summer? I LOVE turning a watermelon into “cookies” and “cupcakes” (I have a recipe for Watermelon “Cupcakes” in my new book, You Can Have It!) and am also a fan of grilling fruit and serving it with the many lean ice creams that are popping up on the market. There are also plenty of other fun (and frozen!) ways to enjoy fruits all summer long in smoothies or a tasty sorbet like this one using Truvia. In a small bowl, add coffee, Truvia Brown Sugar Blend, black pepper, coriander, oregano, and salt; mix well. 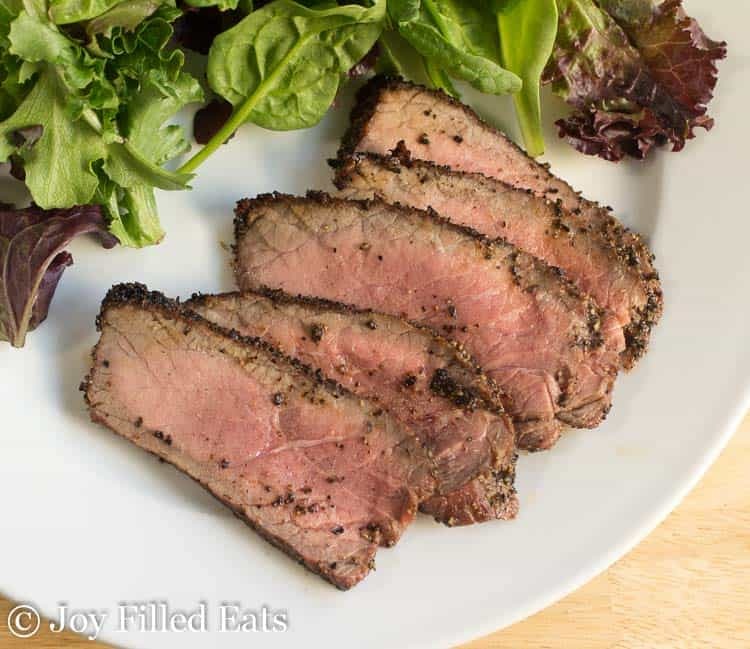 Place the London broil on a cutting board or large plate. Drizzle 1/2 teaspoon of olive oil on each side of the meat, then rub it all over. 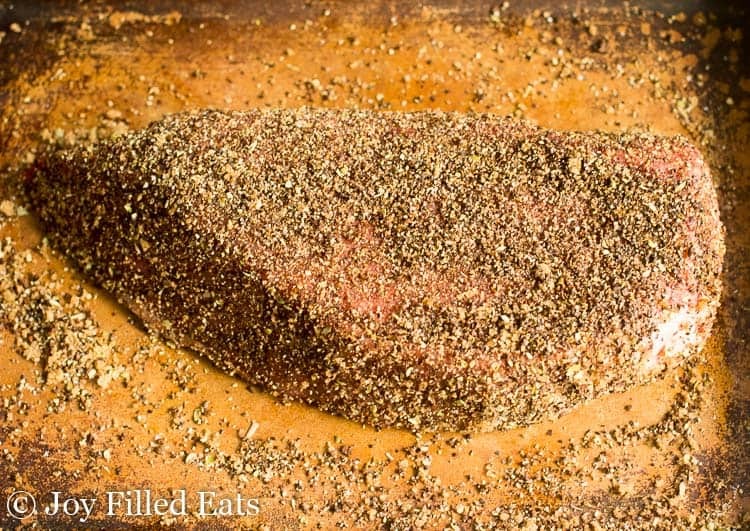 Sprinkle the seasoning mixture over the London broil and rub it in to evenly cover the meat. 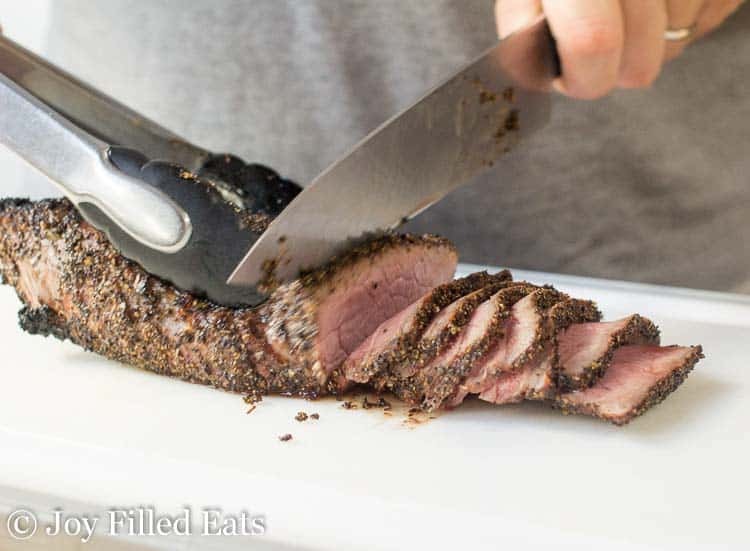 Grill the London broil to desired doneness, about 3–5 minutes per side for medium-rare. Tent the meat with foil for 5 minutes then slice it into very thin slices, cutting on an angle and against the grain. This beef is so delicious! Definitely a new favorite! This is the best beef bark ever! So glad we found Truvia brown sugar blend, trying it in baking next.